Yup, we are the Pineapple Models. 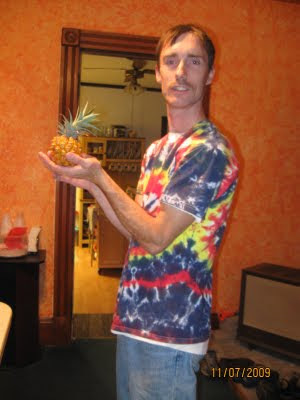 Jeff has been growing this single pineapple for over 4 years now. And this year it finally bear the first single small fruit. Which everyone really amazed to see, [not for me, I've been seeing so many pineapples in my entire life]. At the same time this fruit was really ripe and we finally decided to picked it up from its plant. 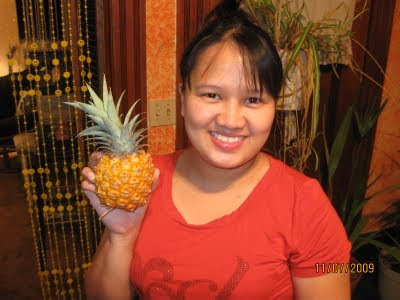 And for a remembrance we post with ourselves holding this tiny pineapple fruits. Now, he is still eager to plant the crown of that fruit. And the fruit isn't really as sweet but smells really really good. ka cute sa pineapple?kumusta ang xmas novs? when man u manganak oi? That is really a FRUIT OF LABOR! Hahaha! Wow after four years, a cute little pineapple! deserve all the photos before it was gone and eaten.. LOL.. Happy New Year to you Novs and to your loved ones!